The IOGEAR Ultra Long Range Wireless HDMI Receiver is compatible with the HDMI, DVI, and VGA transmitters of the Ultra Long Range lineup and supports transmission from up to 600' away in up to 1080p60 resolution. 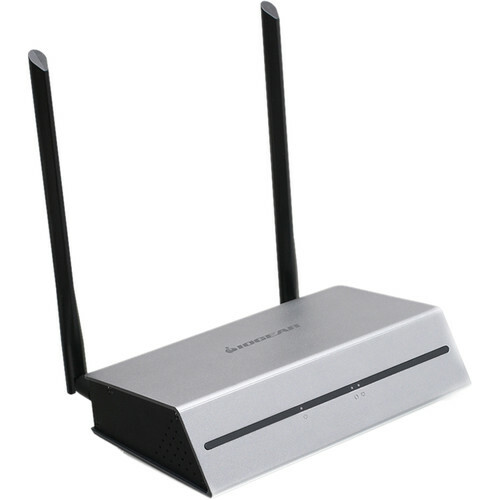 The signal comes in wirelessly over the free 5 GHz frequency band and can then be output to any monitor or projector with an HDMI connection. Like the rest of the lineup, this receiver features a sleek and minimalist design with not much more than an HDMI output and two large antennas on the rear and LED indicators on the front. Complementing the design, the wireless capability of the Ultra Long Range lineup eliminates the need for long cables and prevents cable clutter. Moreover, the Ultra Long Range lineup is a plug-and-play solution, providing for additional efficiency and convenience. Designed for digital signage applications, the receiver is suitable for use in restaurants, retail stores, airports, houses of worship, concerts, sports venues, and office environments to display signals from devices such as computers and Blu-ray players. This HDMI version also supports IR functionality. Connect the included IR extension cable to the IR input on the rear of the receiver and then control your source device remotely by pointing the device's remote control at the receiver. However, this feature only works when paired to an HDMI transmitter (model # GWLRHDTX). Box Dimensions (LxWxH) 10.0 x 6.2 x 3.8"
Can you use 2 transmitter/receiver sets simultaneously? One for a primary display (projecter), and the other for a stage display (tv)? We're afraid not. According to IO Gears you are only able to have one of these systems working at a time in an area. You will not be able to use two of them. How long is the HDMI cable that comes with this Receiver? IOGEAR says : The HDMI cable for the ultra long range wireless kit is approximately 4 Feet long. Thank you for choosing IOGEAR.